I practise family law and often my clients have experienced, or are experiencing, family violence. It can be difficult to discuss “family violence” generally because there is no one experience of violence. A “yes” to a general question about whether or not a client has experienced family violence can mean a hundred different things; just as a “no” can be very misleading. One of my first tasks is to sort out what this means to a particular client. There are stereotypes of those who allege family violence and often those stereotypes lie at the extremes. Some people automatically imagine horrible stories of daily torture. Others are automatically suspicious and imagine a parent who fabricates abuse in order to get the upper hand in custody. These extremes do exist, but most of the time the situation lies somewhere in between. I must acknowledge my clients’ experiences; that violence is a very important part of their stories about where they’ve come from, what they’ve come through, and where they think they can go in future. My clients need to be able to trust that I have heard and understood their stories. They don’t want me to brush it off, push it aside, or minimize it. Sometimes, clients are just starting to realize what they have experienced is abuse and are trying to come to terms with their own histories. They are learning about what is acceptable and unacceptable in a relationship and how to stand up for themselves and their children. This can be a fragile time. My clients need to be able to trust that I have heard and understood their stories. But this does not mean I must blindly accept everything my client offers as truth. I also challenge the holes in a client’s story. There are always two sides (at least) to every tale, and when relationships fall apart we all colour our histories in light of our present feelings. I suspect some of my clients downplay the violence while others certainly exaggerate. Rarely do I think this is intentional; it’s simply a matter of perspective. But it makes determining “the facts” all that much harder: my own client may not even have a good grasp of what really happened. Family court is not the place to find validation for one’s experiences, it is not designed to find guilt, and it does not provide healing. 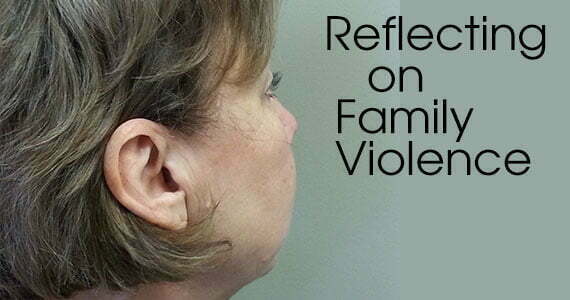 Family violence happens behind closed doors. Most people do not have hard proof that violence occurred so it’s usually a s/he-said-s/he-said situation. I must sort out what a judge is likely to conclude, and then more importantly, how it is likely to affect the parties’ ongoing parenting and financial obligations. I say “more importantly” because family law is practical and it looks ahead. The history of a relationship is often not as relevant as my clients wish it to be and this can be hard to grasp. Family court is not the place to find validation for one’s experiences; it is not designed to find guilt, and it does not provide healing. Rather, the outcomes from family court are orders only setting out financial obligations and parenting schedules. Often, the very formative part of a client’s story, the abuse, is completely irrelevant in law. It can be hard to tell someone “I know you left everything behind to be with this person only to be broken down day after day, but the numbers just don’t work out for you…” but sometimes that is the conversation that must be had. What can be even more difficult to understand is how the court views family violence in relation to parenting. Family violence is relevant to determinations about what might be in a child’s best interests (See s. 18(2)(vi) of the Alberta Family Law Act, SA 2003, c F-4.5) and the court generally accepts the social science that says exposure to violence harms children, but how it will affect the outcome of a specific case is rarely clear. An abusive partner is not automatically assumed to be an abusive or bad parent. This means that the relationship between the parents must continue, despite their past. We can take steps to limit contact or divide up decision-making responsibilities, but that connection will always be there. Further, it can be risky to claim there has been family violence only to have a judge conclude that it did not happen. It can be interpreted as a tactic to alienate the other parent and can be held against the one who made the claim. In other words, such claims can backfire, so we have to tread carefully and focus on what is likely to be proven. An abusive partner is not automatically assumed to be an abusive or bad parent. Sometimes there is conflict between what I tell a client is a likely outcome on parenting matters and what their supporters (family, friends, social workers, etc.) say. Clients have a hard time reconciling the different messages they are receiving and my advice can be drowned out by the many other voices. Building trust with my clients is key to ensuring they take my advice seriously and make wise decisions on how to proceed. Clients often tell me that they really just want their former partner to change; they want them get help for their anger, addictions, or mental health. But the law can only do so much. Counselling can be ordered, but it is expensive and may lose its effectiveness when the other party is unwilling to participate. Other orders, such as terms that parents not say disparaging remarks about each other, can be virtually unenforceable. And enforceable terms, such as limiting access to children, can feel like a punishment to the child. Family violence is also a complicating factor when deciding how best to pursue a matter. Generally, it’s best for parents to work matters out through mediation or negotiation, but when there is a power imbalance, these strategies may be inappropriate. It can be emotionally (and sometimes physically) dangerous to send a client into such a process. This might mean clients litigate more readily, leaving decisions to judges. …when there is repeated family violence, I want to encourage clients to protect themselves and to get out of what is clearly an unhealthy and harmful relationship. Further, victims of family violence may have a compromised ability to make wise choices. Such clients may want to give up on certain items (particularly spousal support or property) in order to avoid further conflict. One of the most difficult aspects of working with victims of family violence is watching a client return to an abuser. I am generally supportive of partners attempting to work through their difficulties toward reconciliation. However, when there is repeated family violence, I want to encourage clients to protect themselves and to get out of what is clearly an unhealthy and harmful relationship. I can discuss my concerns with my clients, but it’s ultimately their choice. I can only act on my clients’ instructions which are informed by their values, histories, and perspectives, not mine. I have done my job when my clients understand their options, rights, and obligations. But, even in light of that knowledge, some people return to abuse. I cannot understand these decisions, but I have to respect them and be available if and when these clients need legal assistance again. Working in family law can be emotionally draining and working with clients who experience family violence only exacerbates these feelings. However, assisting a client to come through and out of such situations comes with high rewards.